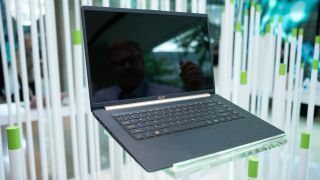 Acer surprised everyone during its annual keynote event in New York City when it unveiled the brand new Acer Swift 5, a whole new take on its flagship 15-inch laptop. This version puts a laser focus on portability and light weight without sacrificing power. The result is a 15.6-inch laptop within a 14-inch frame that weighs just 2.2 pounds (1kg) and features the latest – though unspecified – Intel Core processors. Acer has equipped the laptop with a Full HD (1080p) touch display that bends back 180 degrees, touting an impressive 87.6% screen-to-body ratio. The screen will also adjust gamma and color saturation in real time through Acer’s Color Intelligence technology. Within the tiny frame rests up to 1TB of solid-state storage paired with up to 16GB of DDR4 memory, as well as a USB-C 3.1 port, two USB 3.1 ports, an HDMI port and an SD card reader. That’s quite a lot for a 15-inch laptop weighing about as much as a 13-inch device. The company wasn’t prepared with a working model for the event, but had allowed us to get our hands on a design prototype that we’re told was weighted to match the final weight of the product when it launches later this year – that is, at an undisclosed time for an undisclosed price. Holding the Swift 5 reminds us of the LG gram 15 quite a bit, with Acer’s laptop weighing just two tenths of a pound less than LG’s. This is thanks to an all-new compound material used to comprise the laptop’s base and lid. It’s called magnesium-lithium alloy, an apparently ultra-light metal compound, supported by a magnesium-aluminum alloy for extra sturdiness around the palm rest. This is undoubtedly an impressive achievement in material design, but the end result is a product that simply doesn’t feel as luxe as, say, a straight aluminum laptop. That likely has to do more with our own preconceptions than any truth in one material being less-so than the other. Ultimately, the Acer Swift 5 comes with serious looks and the promise of uncompromised power and all-day battery life. While we weren’t able to glean much from our time with the laptop, one thing is for certain: it’s going to be that much tougher lugging any other old 15-inch laptop around.